At last, I got to see Mondrian//Nicholson In Parallel at The Courtauld Gallery over the weekend, and it was worth the wait. Just two rooms of modestly sized paintings and reliefs, a small exhibition, that delivers a lot. 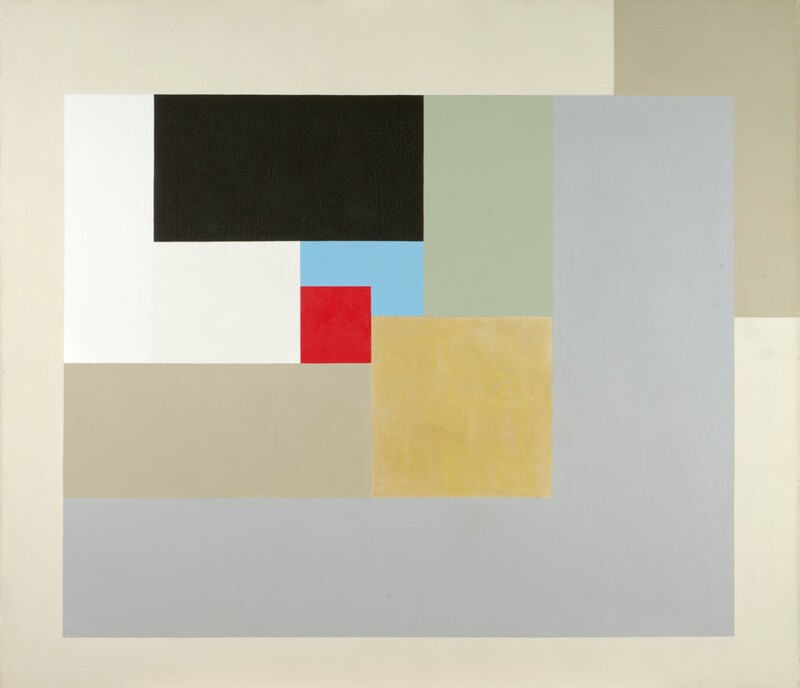 It explores the relationship between the works of Piet Mondrian and Ben Nicholson during the 1930’s when their friendship culminated with Mondrian moving to London in 1938. They worked in neighbouring Hampstead studios for two years, London at this time being the centre of an international community of avant-garde artists. Their influence on each other is undeniable and can be seen in the works shown here in their obvious similarity. I am tempted to say that Mondrian’s influence on Nicholson’s painting seems clearer than the other way round. Stylistically, Nicholson’s work appears to have changed more under Mondrian’s influence than Mondrian’s did as a result of Nicholson’s, but it surely was not the “one way street” that some commentators have inferred. Nicholson did a lot for the reception of abstraction in the UK, and he helped to secure sales of Mondrian’s paintings, these actions alone would have been positively reinforcing for Mondrian’s art. Looking at the work in this show the similarities soon start to give way to the differences. In Mondrian’s Composition C (no. III), with Red, Yellow and Blue, the grid lines and intersectional coloured rectangles seem to refuse any representational associations I might attempt to bring to it. I keep coming up against its decisive abstractness, almost like it says “oh no you don’t” every time I find the beginnings of pictorial content. The Nicholsons’, on the other hand, almost invite it. These two paintings hang side by side in this exhibition, highlighting for me this similarity-giving-way-to-difference. 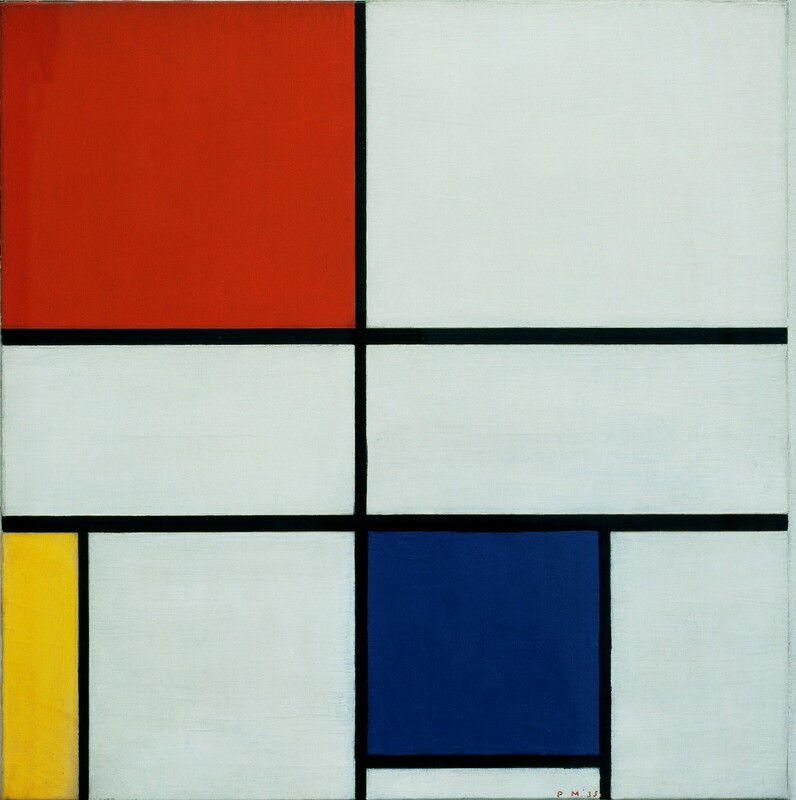 In the Mondrian paintings we get primary colours with Black and White. The painting above being the only one in the exhibition with all three primary colours. By contrast, in Nicholson’s 1937 (painting), planes of primary, secondary and tertiary colours group around a red square, creating a pictorial space with potential associations. For me it resembles architectural forms or possibly a spiral staircase. Although, as with the Mondrian, I am ultimately brought back to its abstractness, it happens less insistently. I am also surprised to find more evidence of underpainting in Mondrian than in Nicholson, looking like the final version of, for example, Composition C is arrived at through multiple re-workings, whereas I wonder if 1937 (painting) follows a more pre-determined course. Not that either of these approaches is better than the other, just different. I love the colours of the Nicholson paintings, so it is with some reluctance that I say that he is most authoritative in the white reliefs, (that somehow I still tend to read as paintings). Even there I find it difficult not to read figuration into the abstract forms. A square and a circle looking at times like a building and a full moon. Nevertheless, it is the purity of the forms that ‘speaks’ rather than those ‘accidental’ associations. And they speak of a time when abstract art was capable of opening up a whole new world of possibilities, compared with today when that language seems more or less fixed, and we speak of the ‘abstract tradition’, not to mention its impossibility. It’s interesting how modernday viewers (especially myself) accept these abstracts as something quite normal. I can only imagine the reaction to these paintings in the 1930’s, no doubt they would have caused general outrage. Looking forward to seeing this exhibition. Yes they seem quite traditional don’t they? None of the viewers appeared outraged or even challenged, all very studiously gazing, glasses on, glasses off, moving back and forth, peering closely to see how the surfaces are constructed, me as much as anyone. My wife was with me, who has fairly traditional tastes and found them totally incomprehensible, not shocking but quite challenging. Then, the next day we visited the Alex Hubbard exhibition at Simon Lee Gallery, contemporary paintings of ‘nothing’ with lots of rubbish like plastic syringes and bits of plastic bottles in resin, and videos with things being moved about, spilled, cut or destroyed, much more challenging in my opinion than Mondrian or Nicholson and my wife enjoyed them and said they were beautiful! She is right they were very beautiful. What surprised me was that she reacted against the Mondrians’ but for the Hubbards’. I would have expected it more the other way around. Both shows are really worth seeing. Brilliant writing on a difficult subject, thank you. It’s interesting to me how we almost unconsciously seek for figuration in work that has been consciously created to obliterate any reference to figuration. In the same way we see faces, animals and figures in clouds, tree bark and ink blots. Off the subject, even though I am Following you I never seem to receive notifications of your posts, OR I am finally losing it…So as long as my eyes hold out I am catching up on your postings tonight. Thanks for all of your visits and Likes at art rat..
thanks for this comment (and the others). We seem to always be searching out for, or perhaps constructing, meaning don’t we? Sometimes when I get email notifications the blog title is missing. I also have the impression that some of my ‘follows’ come to my email inbox and some just go to my wordpress reader, depending on which ‘follow’ button I pressed. ????? I am enjoying art rat. Great Post. I love Nicholson’s and Mondrian’s work and purity but of course they haven’t challenged anybody for a long time as these works once did. It is the great thing about art, it evolves, the new becomes the everyday, the outrageous the forgotten and culturally it propels us with it. HI Nicholas. Thanks for commenting. It’s a good point you make and I agree with it. I did also notice that some viewers were quite challenged by these works. My wife found them to be outrageous. The next day we visited a gallery showing paintings by Alex Hubbard, contemporary and much more outrageous to my mind, but she found those more acceptable than the Mondrians. Hi Andy, on my computer now so will make that reply I lost yesterday. It went something like this: Mondrian and Ben Nicholson and their ilk remain powerful pieces of art but at a more aesthetic level and culturally non-referential, rather than being challenging they are just ‘decorative’, but this lack of reference to may make the appreciation of them by others ‘challenging’ simply because they only now bring this aesthetic dimension and it may be the viewer questions their worth. I don’t know, it is difficult to put into words! However I do remember seeing a group of Mondrians in the same gallery space and thinking how aesthetically beautiful they looked. Alex Hubbard’s work still has some challenge to offer, and it may be for others this is more satisfying to engage with. About twenty years ago I was doing very abstract work with rubbish and discarded packaging so I don’t find it particularly original, but it is still interesting. Maybe artists can look at works from the past amd more easily appreciate the boundaries that had to be crossed to get there and the residual aesthetic value. I think Rothko might fall into this category. In the seventies no-one was in the Tate looking at his stuff (except me!) now it is very acceptable and seen as visually aesthetic by many. Hi Nicholas. I must admit I am quite a fan of Alex Hubbard’s paintings and videos. I wonder if it is possible now to do anything truly original, but I do think there is something new about what he is doing. Hi, I just wrote a reply at some length on my ipad and it disappeared before I could send it! I will write and send it tomorrow! Best, Nicholas. Cheers! Looking forward to it (sorry it got lost first time round).